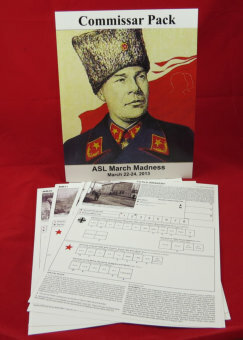 To celebrate and promote its annual “March Madness” ASL tournament, every year the Kansas City ASL Club designs and releases a themed scenario pack. The 2013 iteration of this series is the Commissar Pack, the self-evident theme of which is commissars, although, oddly enough, many of the scenarios in the pack do not contain any commissars on the OB (though they can be exchanged for, one supposes). The commissars in question are all Soviet commissars so that basically makes this an East Front-themed scenario pack (actually, an early East Front pack, as all of the scenarios are set in 1941-1942). The other name for this pack could be the River Pack, as 5 of the 8 scenarios use river boards. Oddly enough, the depth and current of the river is specified in each of these scenarios, even though in every scenario but one there is no actual way for anybody to cross said rivers. Boards (collectively) required include: 3, 7, 8, 12, 13, 23, 33, 34, 37, 40, 52, 58, 60, 61, 64, and 65. Previous iterations of this annual pack were printed only in small numbers–enough for tournament attendees and a few dozen more to be sold on E-bay. The Commissar Pack is the first pack in this series given a somewhat larger print run with the idea of selling more copies to the general ASL audience. The fact that the Commissar Pack is an East Front pack may help with such sales. However, it is not clear how much play these scenarios will get, as these scenarios mostly appeal to only a limited audience. The main “problem” (obviously not a problem for people with similar scenario tastes) with the scenarios in the Commissar Pack is their playability, or rather lack thereof. First, 7 of the 8 scenarios are large in size. Somehow one small scenario managed to sneak in when they were napping. Moreover, many of these scenarios are not simply large but very large. MM30 (Frozen Vzvad), for example, pits 40 Soviet squads against 19 German squads and a ton of guns and fortifications. 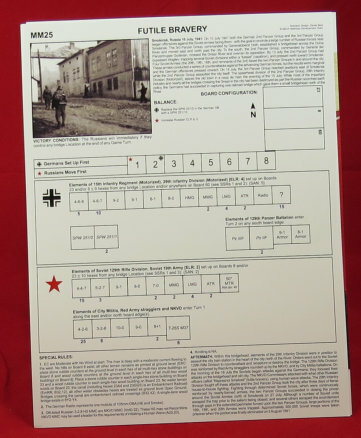 MM27 (Odessa Madness) features 33.5 German and Romanian squads attacking 24 Soviet squads and even more fortifications. Some of the others are similarly gargantuan. They are big in other ways, too. Four of the scenarios use three full boards, three scenarios use two full boards, and one scenario (the baby one) uses most of two boards. Half of the scenarios are 9 full turns long, while three more are 8 full turns long. The “baby” scenario is 6.5 turns long. Generally speaking, these scenarios tend to resemble stereotypical Squad Leader scenarios that included everything but the kitchen sink, because Squad Leader played pretty fast. Advanced Squad Leader, however, does not play fast, and most of the scenarios will take a long (or very long) time to play. Although a minority of ASLers prefer huge, meaty scenarios, and most ASLers certainly enjoy playing a huge scenario every once in a while, the reality is that most ASLers will simply not be able to find the time to play most of these scenarios. Dan Best, who designed all these scenarios, has demonstrated here and in the past that he definitely has a “type,” but the question is how many other people have that same type. To add to the beefiness, 6 out of 8 of the scenarios use at least one module of OBA, while 2 of the scenarios are Night scenarios. No scenarios use air support. Two scenarios, MM27 (Odessa Madness) and MM25 (Futile Bravery) require rules and counters (respectively) from Valor of the Guards. Some of the scenarios are SSR heavy. The most problematic SSR appears in MM25 (Futile Bravery) and consists primarily of 10 tiny-typed lines of terrain modifications, such as “no hills on Board 8 exist” and “no water terrain exists on Board 23,” etc. ASL players as a rule hate to have to remember wholesale terrain modifications. It is a shame this scenario has such modifications, as it may feature the most interesting tactical situation in the pack. A small (only in a relative sense) force of Germans must defend a bridge from a huge horde of poor-quality Soviet troops coming from both sides of the bridge; the Soviets win at the end of any game turn that they control any bridge location. This scenario pack will appeal to East Front aficionados who like Super Big Gulp scenarios. Others may find it a tad too unwieldy for their tastes. You write “oddly enough, many of the scenarios in the pack do not contain any commissars on the OB” — this is not true; every scenario has at least 1 Commissar in the OB (an 8+1 from VotG in many cases). I don’t see the need to wax philosophically about the size of the scenarios. There’s absolutely nothing wrong with the observation that the scenarios are all very large, but you should leave it at that — people will make up their own mind about whether they want large scenarios or not, the additional opinions that you offer on the matter aren’t really relevant here (although would be fine in, say, a dedicated article about the theory and history of ASL scenario design). I don’t think the SSR for MM25 is anywhere near as bad as you make out. “There are no hills on board 8, place a bunch of rubble counters on the board, and the canal is actually a railroad” is what it boils down to, and I don’t think that would overly tax most people. Not to mention, a lot of people play via VASL, which offers board transformations that makes a lot of SSRs like this simplicity itself. The worst such SSRs are NOT those that make “wholesale” changes but those that make “piecemeal” ones — “THIS hill doesn’t exist, THAT hill is actually marsh, no buildings have stairwells (EXC: half a dozen buildings that do) …”. SSRs like that are a nightmare, even in VASL.